For the last 25 years, Lori has been a tireless advocate and volunteer in the blind community. Currently the National First Vice President of the Canadian Council of the Blind, she has spent much of her life giving back to the community. In the 1980’s, Lori had worked for the Canada Employment and Immigration Commission, and while there, with the help of her employer, she had received her first handheld magnifier. However, with increasing vision loss, she left the job and re-located from the Lower Mainland to 100 Mile House, where she began her volunteer work in the blind community. As time went on and as her vision decreased, her assistive technology needs evolved. When she could no longer read the telephone book with her handheld magnifier, she switched to a video magnifier, and then she moved to using more audio-based assistive technologies, such as a screen reader. More recently, her screen reader had become outdated. Lori became aware of the Neil Squire Society’s Technology@Work program and she applied for assistance. With funding through Technology@Work, Lori was able to upgrade several pieces of her software, including her screen reader and a scanning program that turns text to speech. “The cost of this equipment is overwhelming, and the average person could never afford this,” Lori says. In addition to this new software, Technology@Work Occupational Therapists were able to help Lori with a more ergonomic workstation setup, including a new desk and chair, to alleviate the physical pain she was experiencing. Now, Lori can continue her advocacy and volunteer work in the community. 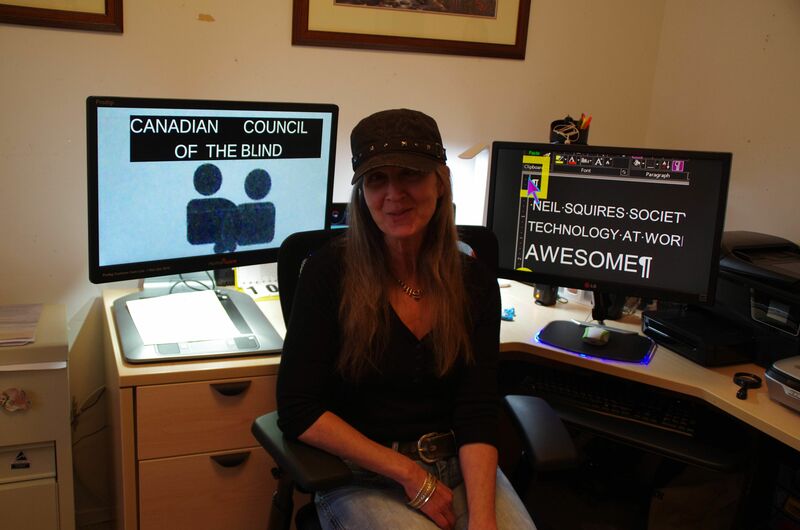 She wants to continue to raise awareness for programs like Technology@Work and other programs like Canadian Council of the Blind’s Get Together with Technology.